With a whirlwind of a summer behind me—planning a wedding, getting married (! ), and taking a full load of graduate credits at the same time—I feel like I haven't had time to catch my breath before the back-to-school season set in. As a teacher, the start of a new school year keeps me on my toes as I get my classroom and lessons in order. When classes begin, there is an adjustment period where my feet have to get used to the long hours of standing, my throat has to adapt to a steady stream of talking in the classic teacher voice, and my brain has to refocus on jumping between ideas at a rapid pace. As my students and I find our new routine, the high energy required in the first couple weeks of school can be draining. This makes weekends a welcome time to recover. I stayed close to home last weekend, enjoying a couple walks around the neighborhood, catching up on summer TV shows, and savoring the quiet before another work week. For the first time in what feels like weeks, I also spent some real time in the kitchen. While the self-watering planters I built this summer did not turn out as planned (only the herbs, green beans, and bell peppers were spared from root rot), luckily the CSA (community supported agriculture) I support has been particularly fruitful. With an abundance of zucchini filling the drawers of my refrigerator, I baked four loaves of zucchini bread before creating something a little more decadent in these double chocolate zucchini muffins. 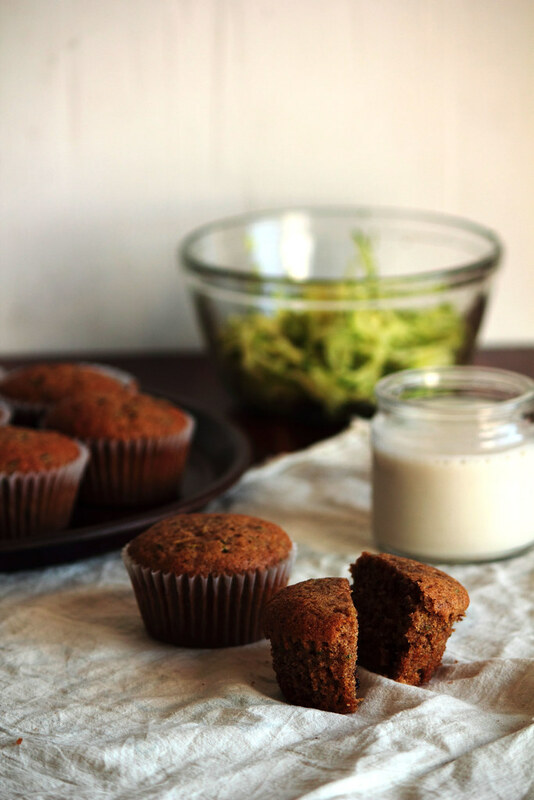 These Double Chocolate Zucchini Muffins take advantage of the late season squash. The muffins feature plenty of chocolate chunks and a hint of cinnamon for a warmer touch. I prefer to heat these up for a few seconds in the microwave until the chocolate just begins to melt. With a large glass of milk, these muffins make for a perfect afternoon snack after a long day at school. Pro tip: Reserve a couple ounces of chocolate to sprinkle over the top to make the muffins look extra delicious. Preheat oven to 350 degrees F (175 degrees C). Line a muffin pan with baking cups. In a large bowl, whisk together the sugar, vegetable oil, egg, and vanilla until well combined. Stir in the grated zucchini. Mix in the cinnamon, baking soda, baking powder, and salt. Fold in the flour and cocoa powder, mixing until the batter becomes uniform. Stir in the chopped chocolate. Fill baking cups 3/4 full and bake for 18-22 minutes, or until a tester inserted in the center comes out clean. For best texture, let the muffins cool before eating. August disappeared with the blink of an eye. At the beginning, I was lying in the sun, reading a book, and everything since then has been a bit of a blur. I've been traveling again; this time I spent a week in California and another driving up the coast to Seattle. I'll share the pictures with you once I get settled back in. With school starting this week and fall just around the corner, it all feels too soon. For now, I'm going to enjoy the end of summer harvest and hold on to the last of the warm summer days. The garden at my parent's home grows two vegetables very well—zucchini and rhubarb. Due to a shady tree, the onions stay small, the cucumbers are few, and the cherry tomatoes are nonexistent, but those two vegetables grow so quickly and so large that it is easy to believe they are trying to make up for the other's flaws. My parents kindly let me use whichever vegetables I please, but even I can't find a use for all of the zucchini. If you want to lend a helping hand, do let me know. Though plentiful in the Upper Midwest, I still have not made my mind up about zucchini. 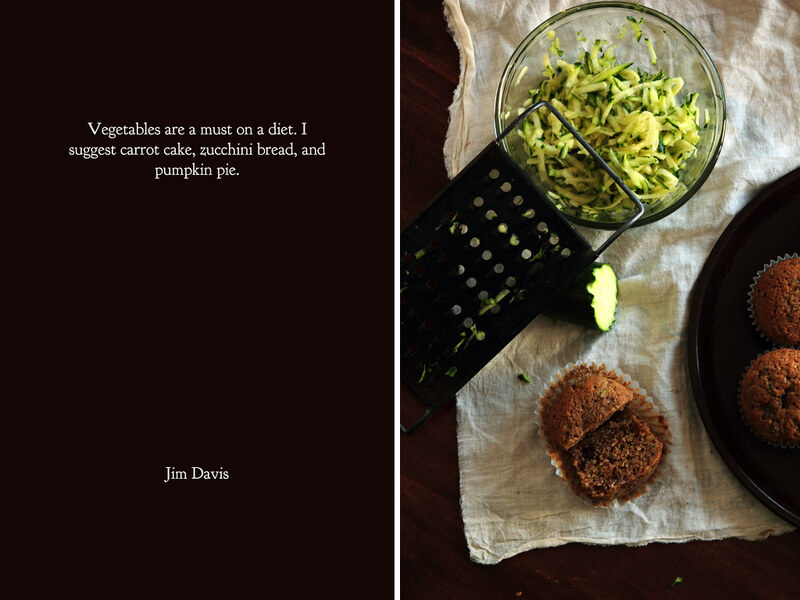 While I could take or leave most savory dishes (except this one), bread is where this vegetable shines. Every year I make loaves of zucchini bread and every year I want to share the same recipe with you again because I love it so. While zucchini bread is wonderful with cinnamon, spices, and chocolate chips, this year I challenged myself to find a new way to enjoy it. With citrus zest for bright flavor and chopped almonds for a hearty bite, zucchini found another way to capture my heart. 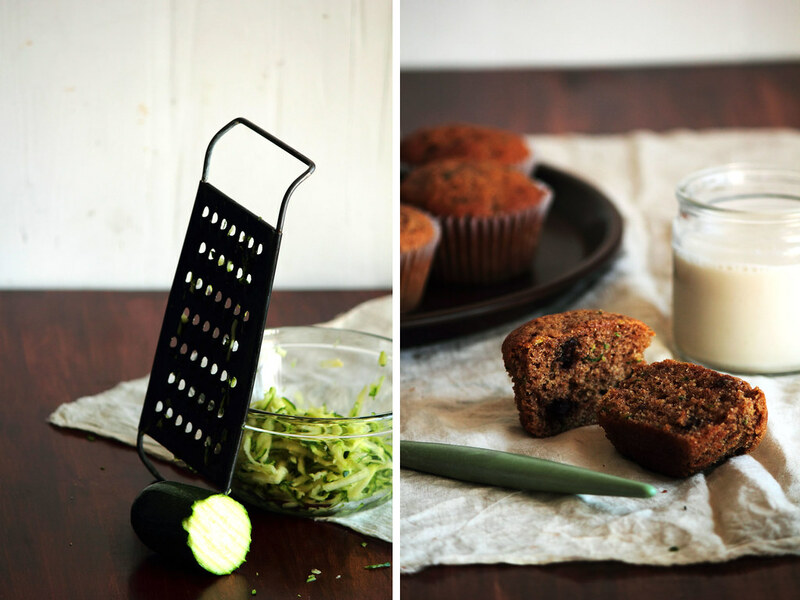 Citrus Zucchini Muffins make for a wonderful end-of-summer breakfast. The muffins are loaded with lemon and orange, a touch of nutmeg, and almonds to make them filling. The muffins are great with a spread of butter, a spoonful of jam, or simply left plain. These muffins surprised me with how much I enjoyed them. The flavors may be simple, but the experience is certainly not. In a large bowl, mix together the sugar, lemon zest, and orange zest until fragrant. Whisk in the egg, vegetable oil, orange juice, and vanilla until well combined. Stir in the grated zucchini. Mix in the nutmeg, baking soda, baking powder, and salt. Fold in the flour, mixing until the batter becomes uniform. Mix in the chopped almonds. Fill baking cups 3/4 full and bake for 18-22 minutes, or until a tester inserted in the center comes out clean. Let the muffins cool briefly before eating. Serve plain or with a spread of jam. Over Labor Day weekend, I spent an afternoon on my grandparent's farm. 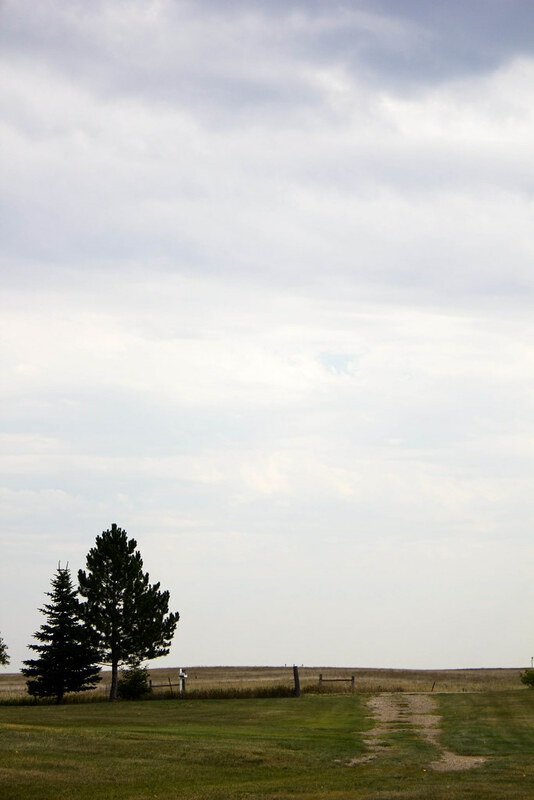 With spacious skies, fresh air, and endless fields of rolling grass, the prairie reminds me why I call it home. My grandparent's farm could come out of a children's book with the bright green tractors, dirt and ducks, and big red barn. A small garden near the house overflows with zucchini and cucumbers. The smell of bread and butter wafts from the windows of the house. 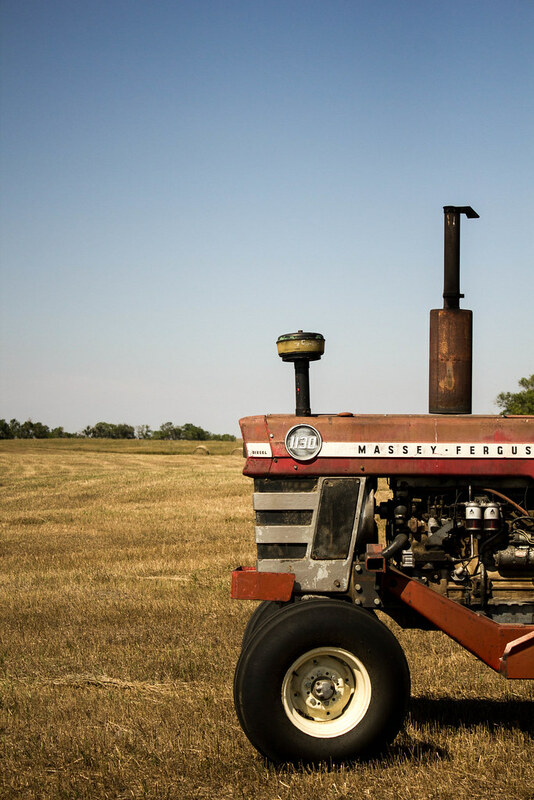 The farm is a place to escape from technology and learn to appreciate the simplicity of nature. My sister and I love to go on "adventures" whenever we visit, exploring the land as it changes between seasons. This time we walked through a sunflower field, dancing between the plants as we weaved a path to the center of the field, the smell of plants and dirt filling the air. The bright green plants with brown flowers towered over our heads, the distinct yellow of the sunflowers fading as the seeds inside prepare themselves for the harvest. Twenty feet into the field, our entrance was completely obscured. The sunflowers appeared to go infinitely in every direction, an endless field of life and growth. Taking a break to rest in the dry dirt, my sister and I stopped to sample the fruits of the flower's labor. The heads of the sunflowers were twice the size of my own, facing the ground instead of the sun from the sheer weight of a fruitful summer. It took two hands to lift the giant flowers up towards the sun; I never knew sunflowers could grow to be so unbelievably large. We sampled the sunflower seeds, plucking them from the center of the flower, admiring the fuzz that surrounded each seed as if it was a ripe peach. The soft fuzz was a surprise for both of us, never imagining that sunflowers were or could be anything other than smooth. The seeds were pure white; the taste subtle. I felt a little closer to the earth that rested beneath my feet. The rev of an engine drew us back out of the field. 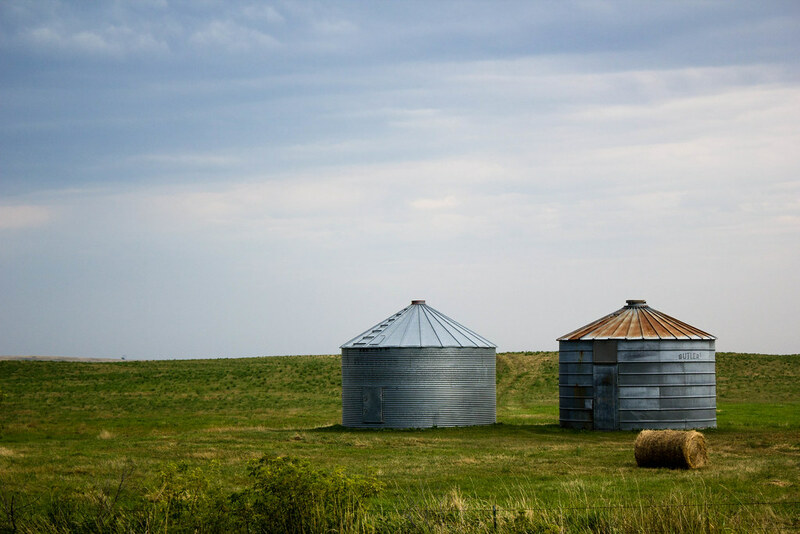 Hopping on a four-wheeler, we drove around the golden fields, the wind tangling my hair as we circled around hay bales, the sun peeking out behind the clouds to illuminate the golden grass. Dinnertime drew us back into the house and the scent of German cooking filled the air. We never fail to eat our fill. At the end of the day, it's hard to leave the farm and go back to reality. I never get enough of the crisp air and piercing stars after a setting sun. 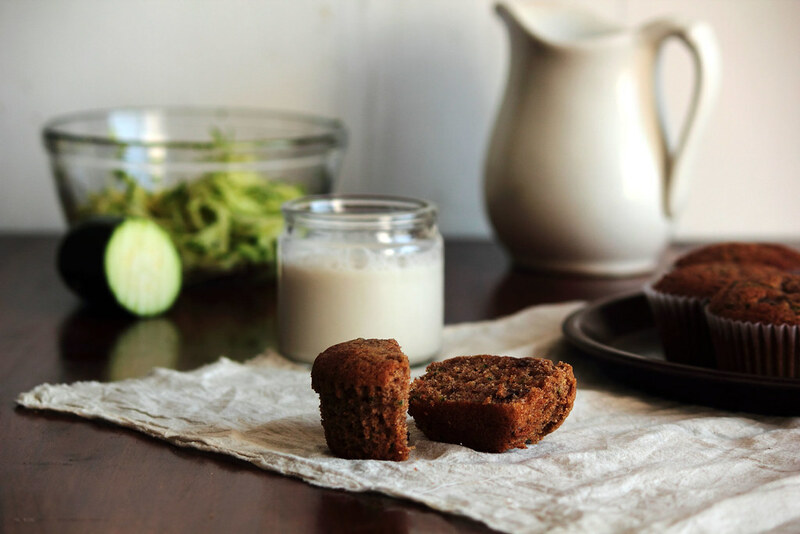 Zucchini Chocolate Chip Muffins feel like a pleasure from a simpler time. The muffins are surprisingly moist and flavorful. Even though zucchini is added to the batter, the vegetable flavor remains subtle. With the addition of cinnamon, nutmeg, and chocolate chips, the muffins are given the feel of a spice cake (with a bite of chocolate every now and then). A simple spread of butter is all these muffins need to make a lasting impression.